Typically a synchronous camera flash (e.g. slave flash) is triggered via an SCR. In this blog post, I will show you a circuit that can be used to trigger a secondary camera flash using an IGBT. Using an IGBT for camera flash triggering has several advantages over the traditional SCR triggering mechanism: for instance, the width of the triggering pulse can be controlled precisely and thus enabling functions such as red eye prevention that cannot be achieved easily using an SCR triggered circuit. Depending on the camera used, the light sensor can be either a CdS photoresistor , a photodiode or a phototransistor. For many automatic cameras, a photodiode or photo transistor maybe necessary as the shutter speed is typically faster than then reaction time of a CdS sensor. The schematics above also shows how both types of sensors can be used. Here is how this circuit works. The inverting input of the comparator (LM339) is referenced at roughly Vcc/2. When the CdS sensor detects the primary camera flash, its resistance drops and the voltage at the none-inverting input exceeds the reference voltage. The comparator output a high (e.g. close to Vcc) and thus triggers the IGBT. The IGBT used here is a Toshiba GT8G131 N Channel IGBT, which is specifically designed for strobe flash applications. It is important to supply a high enough (within safety limit) gate voltage to ensure that the IGBT is fully turned on. Otherwise, the IGBT may not be able to conduct a high enough current to trigger the flash tube. So if you are using other types of IGBT, you may need to adjust the Vcc accordingly. 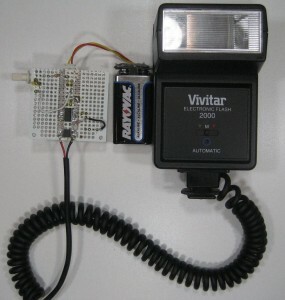 The following picture shows the finished circuit board used with a Vivitar 2000 camera flash.